Since Spring is around and cherry flowers are blooming, I am so excited to welcome such a pleasant season, celebrating a new beginning of life. 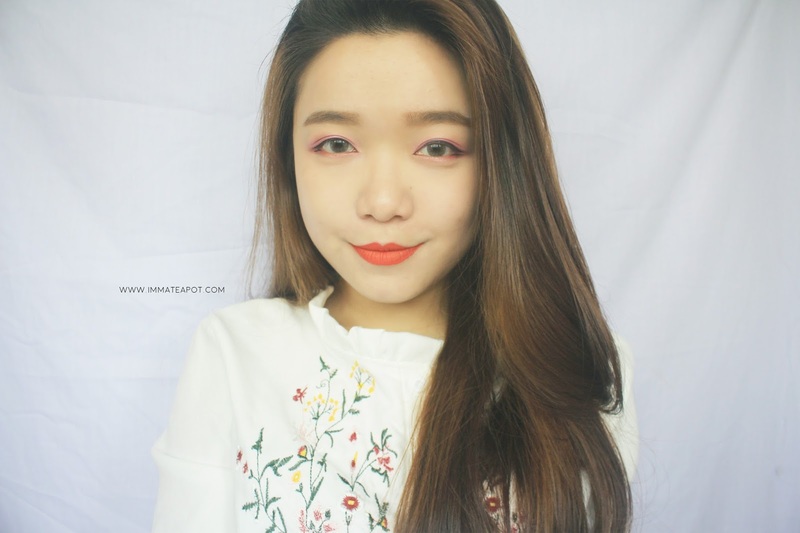 This special season is just the right time for me to share a Cherry Blossom Makeup tutorial with you guys, with Shizens' cosmetics products. 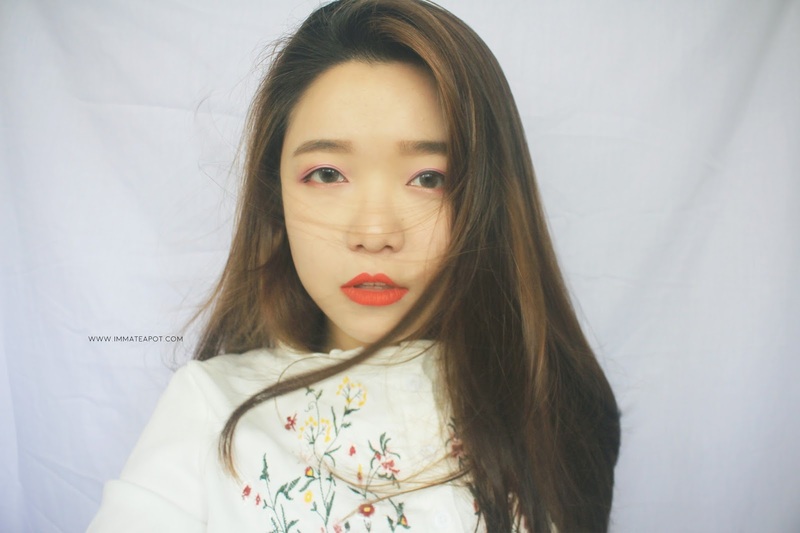 Right in March, Shizens Visage Collection was introduced, with its strong belief behind the brand of bringing out the natural beauty within us from inner to outer, effortlessly, while enhancing one's confidence level, as well as uniqueness. After a brief introduction of the Shizens Visage Collection, lets jump into the tutorial! On the very first, lets get our skin primed with the Shizens Natural Pore Nutrient Foundation PRO, it helps moisture the face with the essential Vitamin E components while fighting against the pore imperfection. 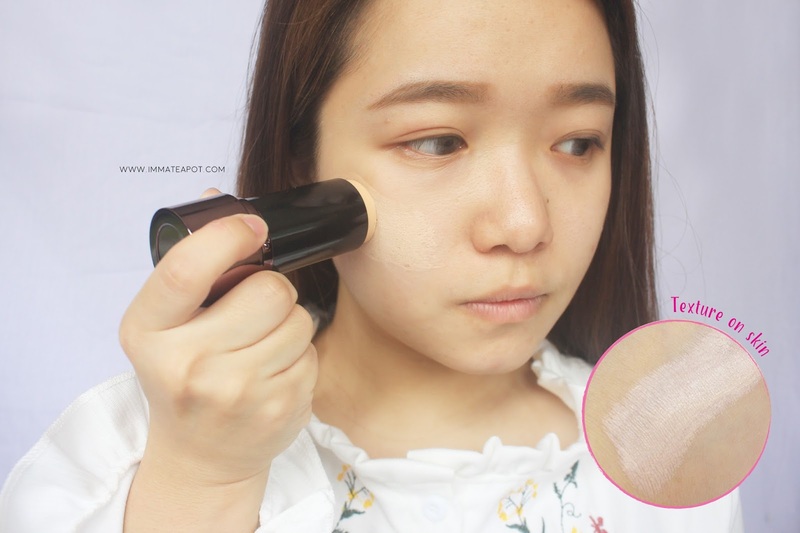 On my very first impression, I thought that the Shizens stick foundation will create a completely thick and extreme coverage make up base, just like how the other stick foundation does. Yet, it gives a total different view. The texture of the Shizens foundation is so lightweight, that it creates a sheer silky finish on my skin, with a touch of moist. Here's a picture with half face completed with the Shizens foundation and another half without, pure naked face. I was so surprised that the foundation give an amazing natural finish on my skin, moist and natural healthy glow. It even up my skin tone, giving it a radiance complexion. 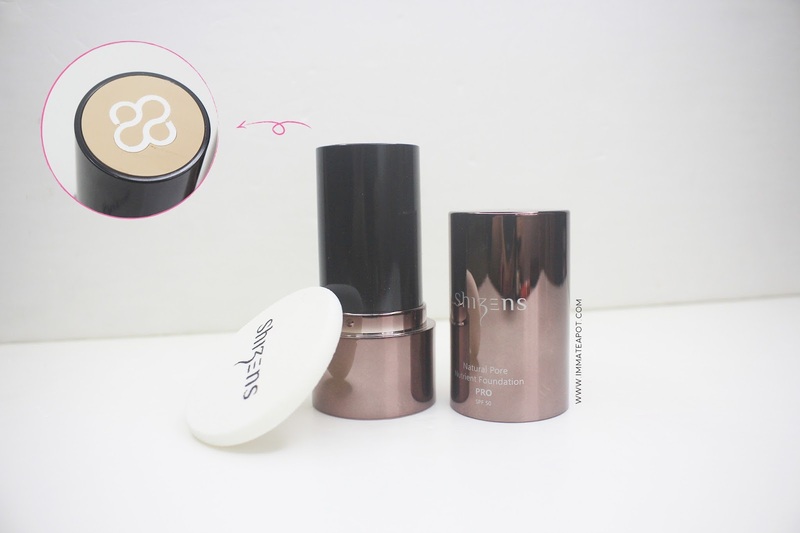 It does a great job on natural coverage as it slightly covers up my dark circle, pores and some other skin imperfections. My pores are less obvious and my skin is so much smoother. You may apply another layer of foundation under the eyes, in order to fully cover the dark circle, by gently dabbing them into the skin. Before moving on to the eyes makeup, I am going to share a bit on the products that will definitely helps in completing our eyes makeup. 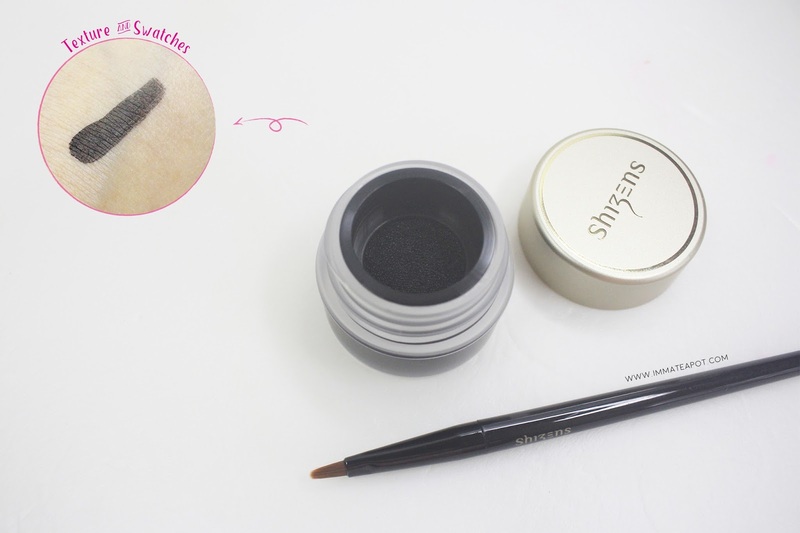 I was totally being cheated by the Shizens Aqua Eyeliner, as I thought it must be the traditional tub of gel eyeliner like what we have been using out there. Instead, it is a cushion type liquid eyeliner! The color is so pigmented and quick drying, it claims to be smudge-proof and long wearing up to 12 hours as well. It glides on the skin smoothly, yet the stroke is not as precise and accurate as the liquid eyeliner in pen shape, as it equipped with a brush, in a much blunt tip instead a sharp tip. Here's the another highlight, which is one of my favorite in this collection - Shizens Smack Lips. It is a liquid lipstick which instantly turn into stunning matte finish. 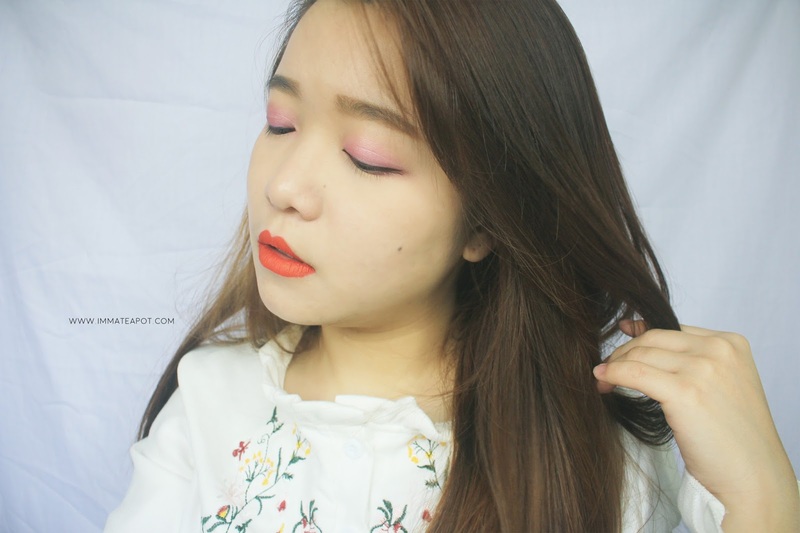 The shade #Orange Tango is just perfect for a cherry blossom look. I really love the matte finish and vibrant color of this Smack Lips collection. It doesn't fully dry the lips as it still contains coconut oil and sunflower butter that helps to lock in lip's moisture, preventing the lips peeling. 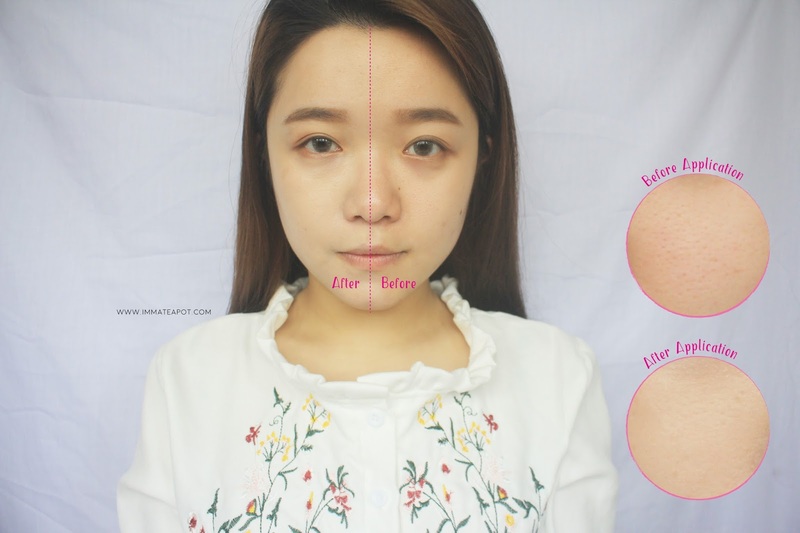 Step 1: After applying the Shizens Natural Pore Nutrient Foundation PRO as makeup base, apply some loose powder under the eyes, that helps prevent the eye makeup from smearing. Yet, do not powder the whole face, as we still need to keep our skin in natural glowy finish. 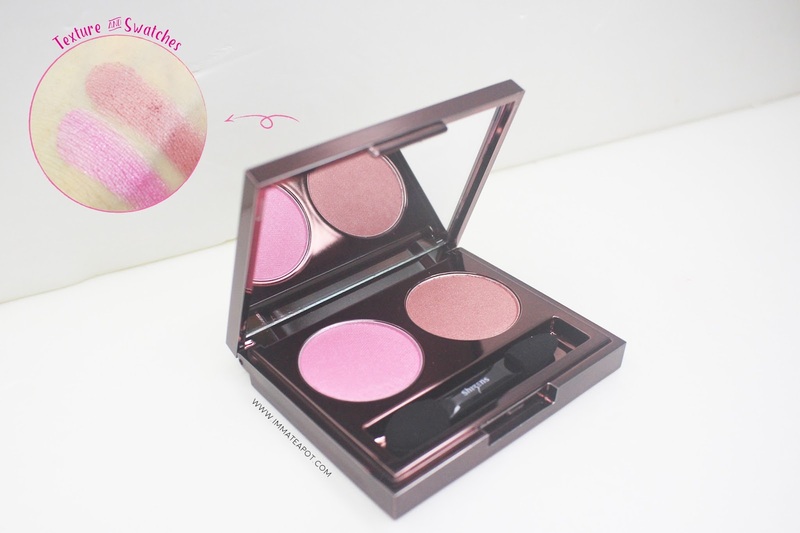 Step 2: Apply the light pink shade from Shizens Hue-Duo Eye Shadow on the eyelid. 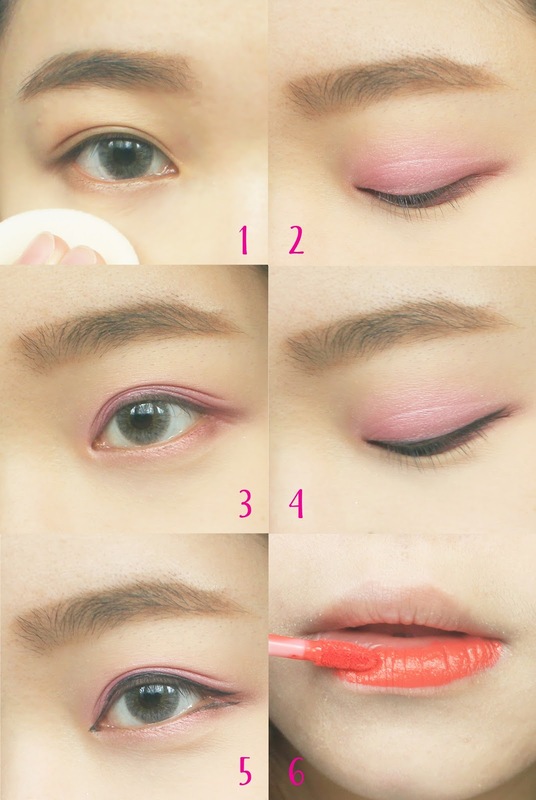 Step 3: Apply the darker pink shade (plum) from Shizens Hue-Duo Eye Shadow on the lower lash line. Step 4: Draw a thin eyeliner on the upper lash line, filling up the gap within the lashes. Step 5: Draw another eyeliner on the lower lash line, about 1/3, extending downward till the outer corner of the eyes, parallel to the upper liner. 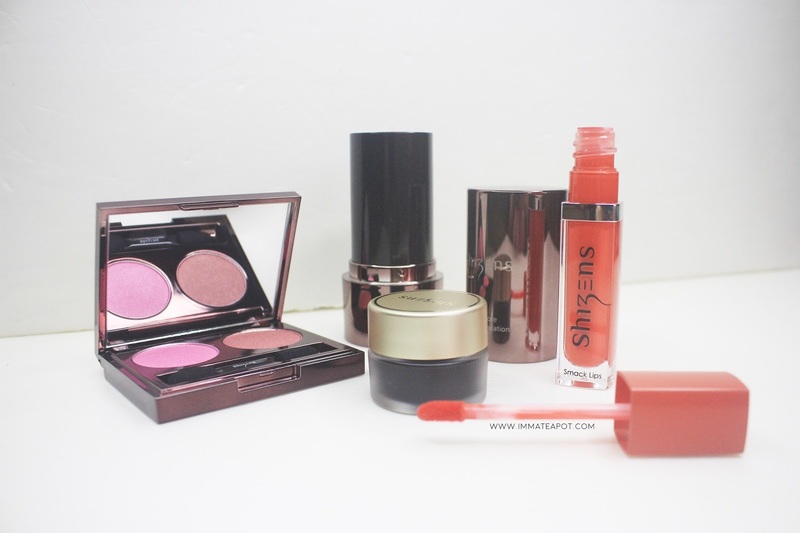 Step 6: Complete the cherry blossom look with the Shizens Smack Lips in #OrangeTango. Here's the finishing look and we are done! 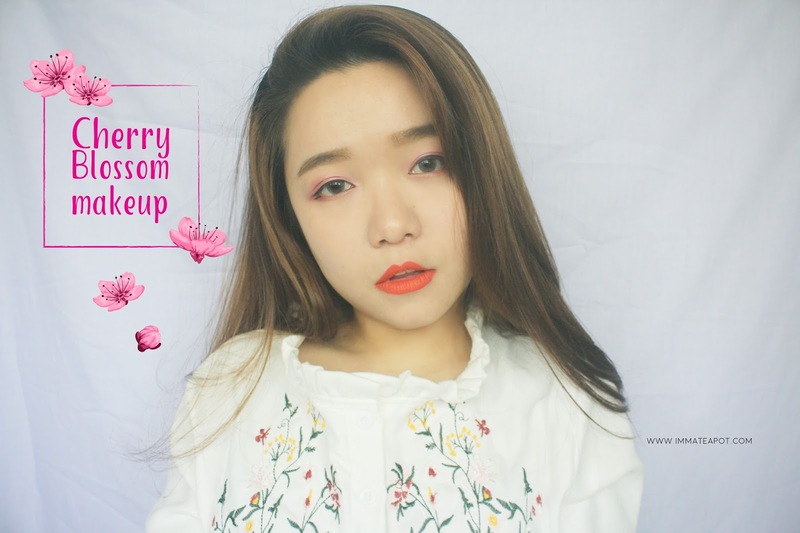 I hope you guys love this Cherry Blossom Makeup and enjoy watching my pictorial. Here's a good news to share where the Shizens Irresistable Introductory Set is now selling at RM199 instead of RM1503, limited time only, till 31st of May. This set including a Smack Lips (Plum Wine & Orange Tango), Aqua Liner (Black & Brown), Hue-Duo Eyeshadow (Mocha Glow) and Shizens Professional Brush Set (6 brushes). 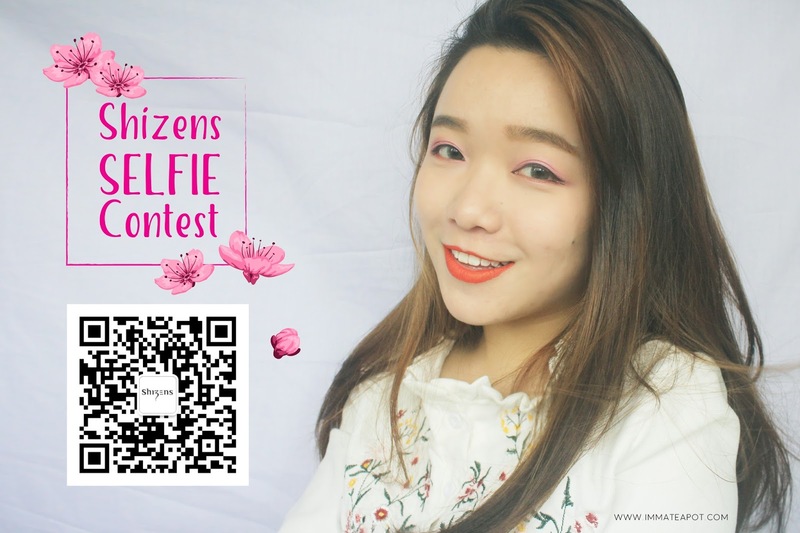 Besides, there's a selfie contest going on and you are just few steps away in winning a grand prize of RM2000 cash + RM6000 of Shizens products! Step 2: Snap a selfie of you after the makeover. Step 4: Submit your selfie with your details with name, IC and contact number on Shizens Wechat. *Contest starts from 14 April - 14 May. Last but not least, don't forget to check out the Visage Roadshow at Mid Valley till 30th April. OMG.. i love that Shizens stick foundation!! Looks nice! I wonder if this texture is like elianto's stick foundation~ because I bought them and so far they are nice! Should also try this product too! Thanks for sharing your tutorial in text form. I find it easier to follow than watching videos. Will check out Shizens soon. Heard a lot about them but haven't tried them personally. Love the beautiful collection. You look bright and sweet with this look. The pink blush hues look so good on u! the colors are very pigmented! very nice! hope to try them out too! Wow! you looks so gorgeous! Love your makeup dear. You look so gorgeous here!